Syazrul and Maizatul holding up their prizes after emerging victorious in the Bintang P. Ramlee 2018 singing competition. Also seen is Jannie (fifth right) who presented the winners with their prizes. 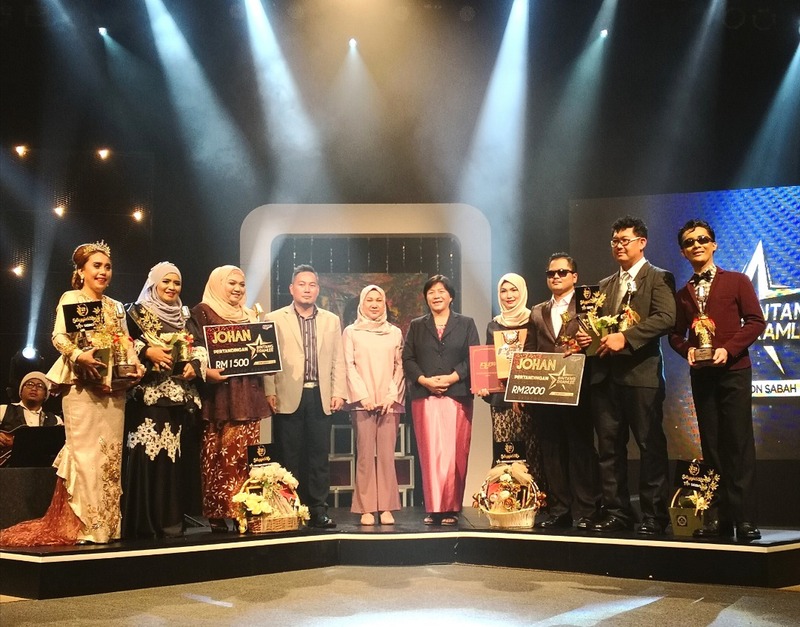 KOTA KINABALU: Perseverance paid off for two contestants of the Bintang P. Ramlee 2018 singing contest, who had previously joined the competition four and two times before respectively. Mohd Syazrul Nizam Matusin from Beaufort, emerged victorious on his fourth attempt at this year’s competition, after coming in third in previous instalments. With his rendition of ‘Jeritan Batinku’, made famous by the late Tan Sri P. Ramlee in the film ‘Ibu Mertuaku’, Syazrul wooed the judges and took home RM2,000 in cash prize with a trophy and certificate. He also delivered a duet with fellow contestant Jamilah Hanchus in their rendition of ‘Yang Mana Satu Idaman Kalbu’, during which Syazrul was dressed in a chef’s attire to re-enact the scene from the movie ‘Labu dan Labi’. Meanwhile, second time was the charm for Maizatul Asfa Marzuki who won in the female category with a song from the movie ‘Ribut’, entitled ‘Sang Rajuna Hati’. Maizatul, who is from Membakut, also duetted with Fuad Arjayani Ajad for the song ‘Gelora’. Fuad, also a second-time contestant, had been shortlisted two years ago. He expressed hope that the younger generation would continue to take an interest in P. Ramlee songs as they are national treasures. Maizatul bagged a cash prize of RM1,500, a trophy and certificate for placing first. She and Syazrul will be representing the State at the national-level competition in Kuching, Sarawak, on October 6. Other contestants took home a consolation prize of RM700, a trophy and certificate. The prizes were presented by Assistant Minister of Law and Native Affairs Jannie Lasimbang. The competition, themed ‘Sepanjang Zaman’, sought to find talent that best presented P. Ramlee songs, as well as to pay homage to the artist’s legacy. Bintang P. Ramlee 2018 was recorded before a live studio audience and will be aired on RTM TV2 at a later date.